More than twenty years went into the building of St. Joseph Apache Mission. It was mainly the inspiration and work of Father Albert Braun, O.F.M., who first came to Mescalero as a young Franciscan friar in 1916. Soon after he arrived he saw the need for a new church because the old adobe structure was too small and in poor condition. His work here in Mescalero was interrupted in 1918 when he went to Europe as an Army Chaplain. 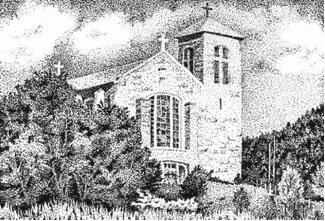 When he returned to Mescalero after the war he was determined to build a church like the grand Cathedrals in Europe to serve the Apache people and as a memorial to those who had died in the war. Father Albert received permission to build a church, but was given no funding. Armed with $100 left from his Army pay and a free pass to ride the railroad, he went to Philadelphia to see noted architect, William Stanton. Inspired by the dream of Fr. Albert, Mr. Stanton drew the plans as a gift. 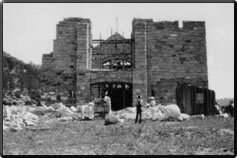 In 1920 with a couple of volunteers the foundation, which is seven feet deep in places, was dug and construction was underway. Tony Leyva, a stonemason and friend of Father Albert's from Santa Barbara, CA, volunteered to come to Mescalero and help Father Albert build the Mission. Tony asked only for room and board and to be returned to Santa Barbara to be buried next to his wife upon his death. The construction was done mostly by volunteers, including Father Albert and several Franciscan friars. All material used is native to the locality. In the winter stone was quarried about four miles west of the Mission in Bent, NM. The stones were then hauled to the building site in the spring. The lime for the mortar was burned in pits near the Mission. The stones were laid during the summer and fall. The timber for the ceiling and roof were purchased from a local sawmill. The tiles for the roof and floor came from the old La Luz Pottery Plant in nearby La Luz, NM. The lighting fixtures were designed and made in Juarez, Mexico. In 1939 the building was considered complete, and a grand dedication ceremony was held on the fourth of July. For many years the windows were boarded up for lack of funds. The present windows were specially designed for the Mission and installed in 1961 by a glass company from El Paso, TX. The Mission is laid out in the form of a cross. It is 64 feet wide and 131 feet long. It is 50 feet to the rafters, and 80 feet to the roof peak. The tip of the cross on the bell tower is 103 feet high. The bell tower walls are four feet thick at the base. The grave outside of the Mission is where a Franciscan friar, Brother Salesius is buried. (See photo to the left.) He was killed during construction of the mission while trying to unload one of the heavy stones from the truck. The stone crushed his chest. He died two days later. Brother Salesius had been an artilleryman for the German Army in World War I. Father Albert served as a Chaplain in World War II and survived three and a half years as a prisoner of war in the Philippines. After the war, Fr. Albert returned to Mescalero and rededicated St. Joseph Apache Mission to the veterans of both World Wars. In 1947 Fr. 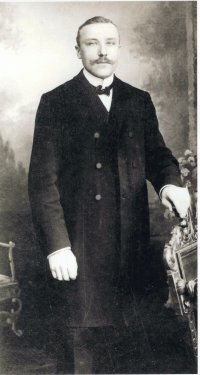 Albert was transferred to Phoenix, AZ, where he went on to serve the Mexican-American population with the same zeal he had brought to his ministry among the Apaches. He died in a nursing home in Phoenix on March 6, 1983 at the age of 93. His remains were returned to his beloved Mission, and are buried in the sanctuary. Improvements have been made to the Mission through the years. The roof has been repaired, the center arch has been reinforced, and the windows have been strengthened and replaced. In the 1960s the tile roof was redone. In 1986 a radiant heating system was installed which involved re-tiling the floor. At that time the baptistry at the base of the bell tower was turned into a daily chapel. Artwork has been added over the years, including the pictures of the Apache leaders in the back of the Mission, and the three-part mural depicting an Apache puberty ceremony with the traditional crown dancers. The Stations of the Cross were brought over from the Philippines and mounted on backgrounds painted by a local parishioner, Bruce Klinekole II. The icon of the Apache Christ above the altar in the front of the Mission was painted for the Mescalero Apache people in 1989 by artist Robert Lentz of Albuquerque, NM. Today the Mission remains an active parish church with 385 parish families and thousands of visitors from around the world. It is an important center for community activities. The food bank serves hundreds of people a year. There is a gift shop with many Native American items for sale, and an information center for visitors to enjoy. The goal of the Restoration Committee and crew is to keep the Mission open and usable during the restoration process. Visitors are always welcome and are encouraged to visit this cherished and sacred space often.